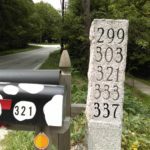 Mailbox and street number out on Bedford Road is complete. 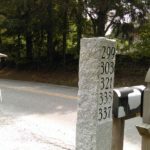 Paul found a stone engraver who was able to add my house number to the existing granite post at the end of the common driveway (My parent’s and I struck out with two different sources). 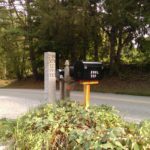 I bought at Vanderhoof’s Hardware in Concord an extra large US Postal approved mailbox and from Concord Lumber some spray paint and a 4×4 post. A quick trip to Woodcraft Supply for some exterior grade penetrating oil (and an opportunity to drool over all kinds of tools) and I was all set. Over the last weekend, in a lazy sort of way, I put a number on the box and built a post. My Dad got some iron rebar (for reinforced concrete) and I drilled a hole in the end of the post and drove the remainder into the ground. The idea (given to me by one of the neighbors) is that if it gets hit by the town snow plow, the rebar will give or bend – but the rest of the post and mailbox will survive the impact (and on my Dad’s advice, the mailbox itself is not actually screwed down – it is just a tight fit on the wood undertray). The stone engravers did really well to match the other house numbers by the way. This week we got the fire permit and I believe the Board of Health has now signed off. There may be few more inspections to do – but Paul believes that we can get an occupancy permit next week? The Conservation Commission still needs to review and sign off on the pre-conditions – but they normally apparently like to wait till you have grass sufficiently established that you have mowed it twice before doing that. Not sure when move in date will be – but it definitely is getting closer!